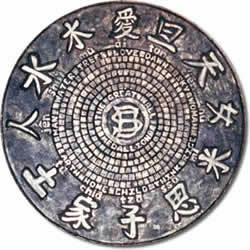 An artistic monogram on a NYC manhole cover inspired the incorporation of Oriental Calligraphy. The symbols have a universal message of hope and aspirations for life. Chinese monosyllabic translation was chosen because it was brief and would fit around the circumference. 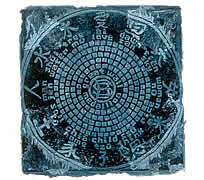 All the symbols and letters were carved backwards into the printmaking wood block. The mandella theme dates back to ancient history as a symbol for everlasting love, a circle of protection, etc. Love (ai) was placed at the top,Woman at 3:00, Child at 6:00 and Man at 9:00. Dawn and Sky also represented weather and spiritual components. Rice stood for sustenance. Thinkwas education and knowledge. Tree and Home provided shelter. Soil nurtured plants and animals. Water was a life-giving force. Tree also indicated a major resource. Together these symbols blended for 12 important components in the circle of life. The paper was pulped from 100% cotton rag linters. It was blender- beaten and poured on a 24″ x 24″ frame. Of course it took many containers to make a large thick sheet. Cheese cloth was artfully added for texture. Golden fibers gave it sparkle. Later it was dyed and sized with methyl-cellulose. After the paper air dried, the printing block was inked a deeper color. The paper and block were run through the press for image and embossment. The damp print was dried under blotters and weights. “Grate Wall Medallion” is limited to twenty prints. Each print is uniquely different in paper surface treatment, ink- color and artistic variations.